Looking east from the Vista House, Interstate 84 follows the Columbia River Highway toward Cascade Locks and Hood River. The freeway hugs the south bank of the massive river, much the same way as Washington 14 hugs the north bank. As the main east-west route across Oregon, I-84 stays close to the river while the Historic Columbia River Highway (former U.S. 30) follows higher ground along a much more winding route. Photo taken 08/27/06. The western Interstate 84 is the primary route linking the northwestern cities of Salt Lake City, Boise and Portland. This one of two instances of Interstate 84; the other is the eastern Interstate 84 in Pennsylvania, New York, Connecticut and Massachusetts. Interstate 84 in Portland is known as the Banfield Expressway; it is named after a former head of the Oregon Highway Commission. 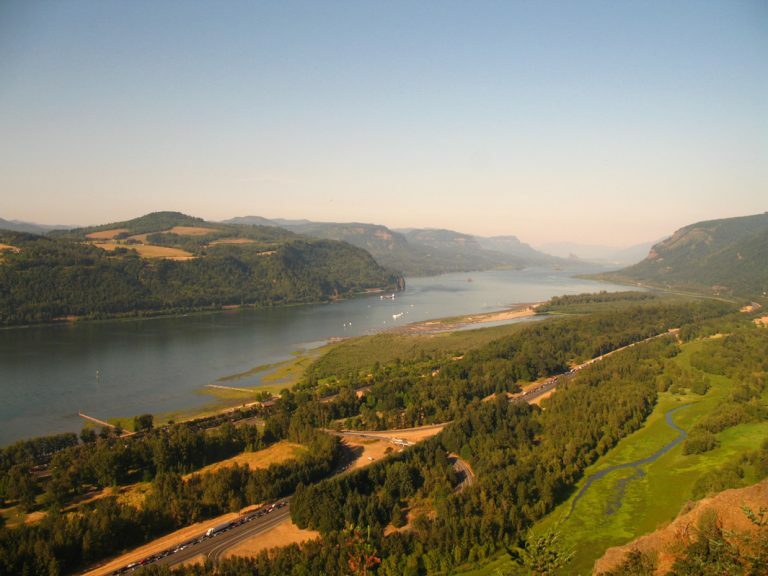 The stretch east from Portland through the Columbia River Gorge is one of the most scenic sections of Interstate Highway in the entire system. Interstate 84 largely follows U.S. 30 from Portland east to Rupert, Idaho. East of Rupert, U.S. 30 used to split into two branches: U.S. 30N and U.S. 30S. 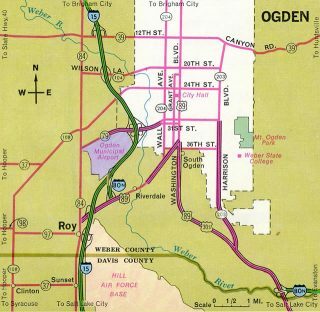 Today’s Interstate 84 replaces U.S. 30S from Rupert southeast to Echo Junction via Ogden, Utah. The freeway was completed within Oregon in 1975, but it still had several Super Two sections, including the segments from Boardman (Exit 164) to Stanfield Junction (Exit 188) and the Pendleton Bypass. These segments were upgraded to full Interstate standards with four lanes by 1980. Today, Interstate 84 follows the Banfield Expressway through Portland. This freeway was constructed prior to the implementation of Interstate standards, and it would have required a costly retrofit to modernize the highway. As a result, a new route was suggested for Interstate 84. The proposed reroute of I-84 through eastern Portland between Interstate 5 and Interstate 205 would have followed the unbuilt “Mount Hood Freeway” instead of the Banfield Expressway. In the mid-1960s, various alternate alignments were considered for the Mount Hood Freeway, which would have been about five miles in length. The alignment selected for this freeway was known as “Division-Powell” corridor because it was to have followed U.S. 26 (Powell Boulevard). To facilitate connecting the Mount Hood Freeway with existing Interstate 84 (80N) east of I-205, a 2.5-mile overlap with Interstate 205 would be required. In 1968, the Oregon Department of Transportation tried to obtain approval for this proposed routing. As local communities became aware of the freeway’s proposed impact in established neighborhoods, a lawsuit was filed in 1972 in the U.S. District Court. The lawsuit demanded additional corridor studies and a full Environmental Impact Statement for this project. 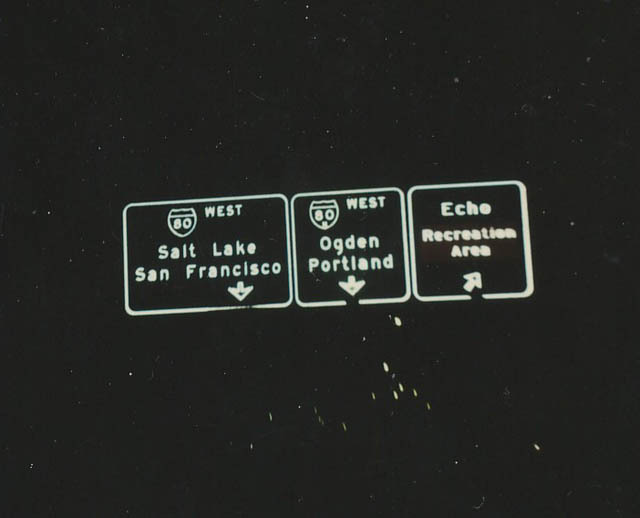 Button copy overheads posted ahead of the westbound split of Interstates 80 and 80N at Echo, Utah. Photo taken by Michael Summa, 1976. 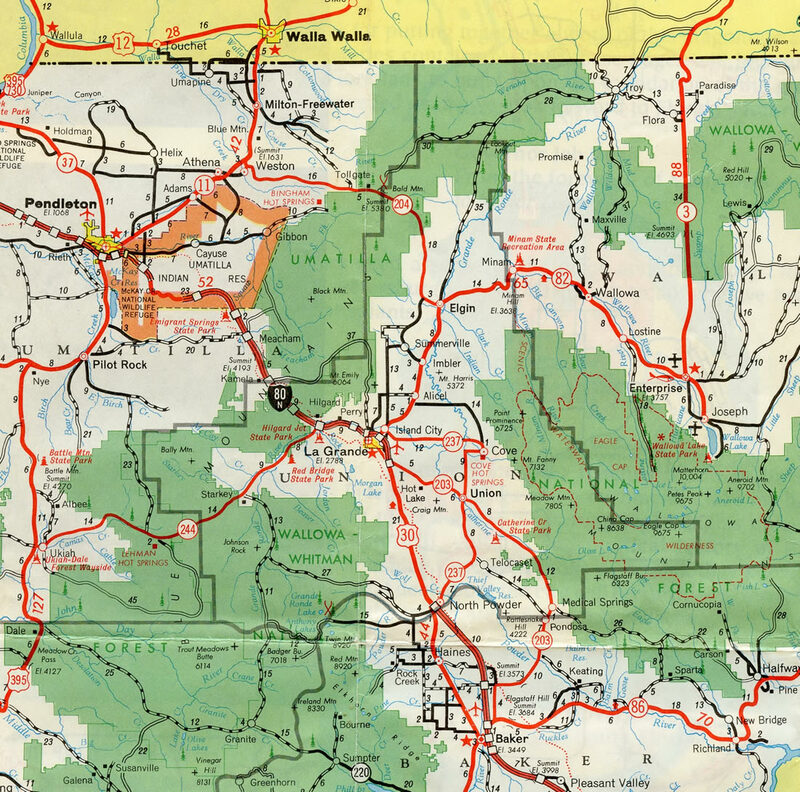 Northeastern Oregon – 1973 Oregon Official Highway Map. 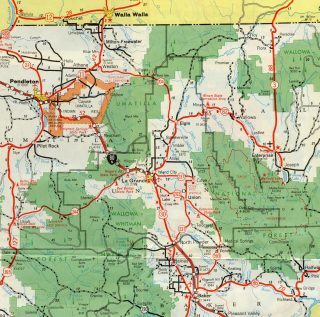 The last two sections of U.S. 30 to be upgraded to Interstate standards were stretches through Umatilla Indian Reservation and between La Grande and North Powder in eastern Oregon. Additionally a Super-Two portion of freeway ran south from U.S. 30N / Oregon 201 (Exit 356) to the Idaho state line. 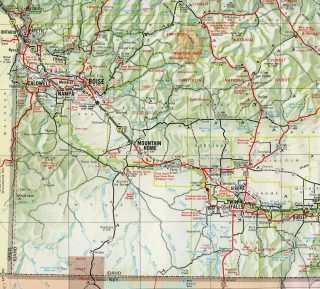 Southwest Idaho – 1969 Idaho Official Highway Map. Interstate 80N stretched east from the Oregon state line to Boise and from South Federal Way near Exit 57 to Mountain Home in Idaho. The two sections were linked by late 1969. 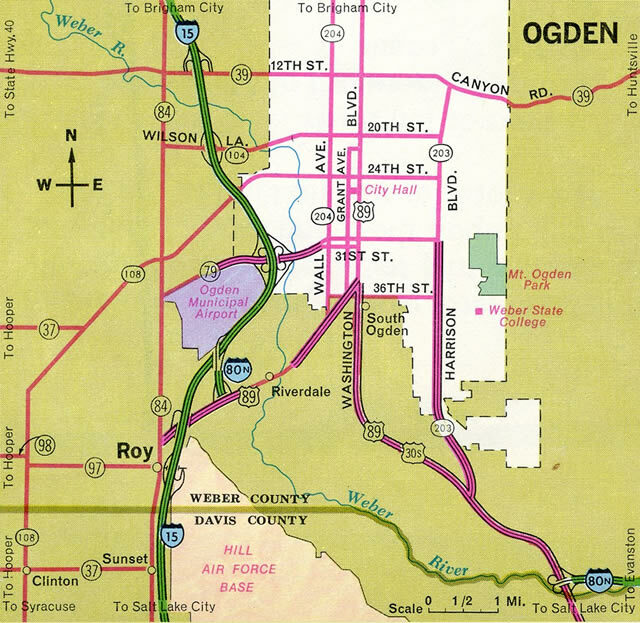 Ogden, Utah – 1972 Utah Official Highway Map. Interstate 80N was completed east from U.S. 89, south of Ogden, to Devils Slide by 1969. 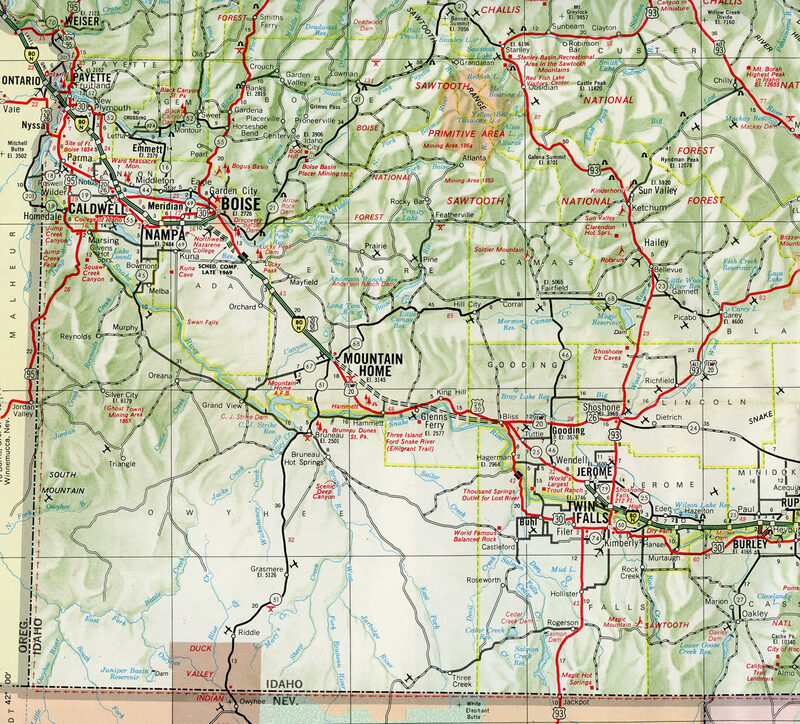 A stub of I-80N also connected I-15 with Utah 26, shown here as U.S. 89 as well, at what is now a SPUI. Travelers leave the Henefer town limits and pass by the final reassurance marker for Interstate 84 east. Photo taken 07/13/16. The first in a series of diagrammatic signs outlining the single lane ramps (Exits 120A/B) for Interstates 80 east and west at Echo Junction. Photo taken 07/13/16. Interstate 80 enters Echo Junction from Evanston, Wyoming, 33 miles to the east. The freeway turns south from I-84 to Coalville, Silver Creek Junction and Park City before resuming a westward heading through Parleys Canyon and Salt Lake Valley. Photo taken 07/13/16. The agricultural areas of Henefer Valley give way to hills west of Echo Dam an south of Echo Canyon. I-80 traverses Echo Canyon along a remote stretch to the Wyoming state line. Photo taken 07/13/16. Sign changes made at the east end of I-84 assigned Exits 120A/B for the Interstate 80 ramps. Previously only the westbound ramp was assigned as Exit 120. Photo taken 07/13/16. Interstate 84 ends as traffic partitions for I-80 east to Cheyenne, Wyoming and I-80 southwest to Salt Lake City. Photo taken 07/13/16. Interstate 80 runs along the western periphery of Echo Reservoir from Coalville to Exit 168 with I-84 west. Photo taken by Steve Hanudel (05/16/06). Exit 186 departs from Interstate 80 east for I-84 northwest through Henefer Valley and Devils Slide. The eastbound control city for I-80 is Cheyenne, Wyoming, located nearly 400 miles east of here. Photos taken 07/05/16. A semi directional T interchange (Exit 168) joins Interstates 80 and 84 at the mouth of Echo Canyon. Photo taken by Steve Hanudel (05/16/06). Interstate 80 westbound is silently merged with U.S. 189 southbound as the freeway reaches Exit 169 to Echo Dam Road and approaches the split with Interstate 84. I-84 is the first Interstate to meet I-80 since leaving Cheyenne, Wyoming. Photo taken 07/11/15. An auxiliary lane accompanies Interstate 80 west from the Echo Canyon Road (old U.S. 30S) on-ramp to Exit 168. Interstate 84 travels northwest from Echo Junction to Morgan, Ogden, Boise, and Portland among other communities in the northern Rockies and Pacific Northwestern states. Photo taken 07/11/15. A branch of the Union Pacific Railroad line passes over I-80 at the separation with Interstate 84. I-80 & U.S. 189 turn southward toward Coalville and Silver Creek Junction on the 40-mile drive to Salt Lake City. Interstate 84 meanders northwest five miles to Henefer and 39 miles to merge with I-15 north in Ogden. Photo taken 08/25/14. The first confirming marker for Interstate 84 west stands just north of I-80 in Henefer Valley. The freeway parallels the Weber River, a Union Pacific Railroad line and Echo Road (old U.S. 30S) to the town of Henefer. Photo taken by Dale Sanderson (10/13/05). Most of the Banfield Expressway segment of Interstate 84 is below grade on a shared alignment with the TRAX light rail system. Passing under the city street grid, only three exits are afforded for westbound travelers. Pictured here is the final reassurance shield assembly for westbound. Photo taken 09/02/06. Interstate 84 & U.S. 30 separate the Kerns and Sullivan’s Gulch communities on the one mile approach to Interstate 5. Photo taken 09/02/06. The Portland skyline comes into view as the Banfield Expressway turns southwesterly and lowers toward the Willamette River. Flyovers to I-5 follow for Beaverton and Salem to the south and Downtown Portland (via I-405 south) and Seattle, Washington to the north. Photo taken 09/02/06. U.S. 30 joins I-5 north to the Fremont Bridge (I-405) to continue west toward Astoria. The US highway is not signed on the mainline of Interstate 5. Photo taken 09/02/06. Oregon 99E (Grand Avenue) north spans the Banfield Expressway as Interstate 84 westbound ends. Photo taken 09/02/06. Ramps for Interstate 5 north and south include local connections. The southbound flyover ties into a distributor roadway (Exit 300B) for the Morrison Bridge west to Downtown and Belmont Street to Central Eastside Industrial District. Photo taken 09/02/06. An off-ramp for the Rose Quarter, Steel Bridge and Oregon Convention Center lowers from the northbound I-5 flyover. Photo taken 09/02/06. U.S. 30 continues west onto I-5 north as the 1st Avenue exit to the Rose Quarter parts ways. U.S. 30 extends north through the Northwest Industrial area of Portland to St. Helens and west to U.S. 101 at Astoria. Photo taken 09/02/06. Interstate 5 south & U.S. 30 east curve southeast from the split with Interstate 405 to meet I-84 east (Exit 301) just south of the Rose Quarter. Photo taken 08/27/06. The Ramsay Way on-ramp adds a third southbound lane to the semi directional T interchange (Exit 301) with Interstate 84 east. U.S. 30 splits with I-5 south to combine with Interstate 84 (Banfield Expressway) to the Columbia River Gorge, Hood River and The Dalles. Photo taken 08/27/06. Interstate 5 straddles the eastern banks of the Willamette River from I-84 (Exit 301) southward to the Marquam Bridge. I-84 comprises a busy commuter route east to Gresham, Fairview and Troutdale. Photo taken by Chris Elbert (04/24/05). A high flyover (Exit 301) shuttles motorists onto the Banfield Expressway as Interstate 84 & U.S. 30 wind east through the Sullivan’s Gulch, Kerns, Laurelhurst and Rose City Park neighborhoods through east Portland. Photo taken 08/27/06. Interstate 5 travels high above the Willamette River (via the 1966 Marquam Bridge) north from I-405. The forthcoming off-ramp (Exit 300) for the eastbound beginning of Interstate 84 departs well ahead of the semi directional T interchange between the two freeways. Photo taken 08/27/06. Exit 300 branches away from the I-5 mainline as a lengthly distributor roadway serving not only Interstate 84 & U.S. 30 east, but also the Central Eastside Industrial District. Photo taken 08/27/06. Exit 300 partitions into ramps for Yamhill Street east and Interstate 84 & U.S. 30 (Banfield Expressway) east. I-84 & U.S. 30 overlap throughout most of Oregon including the 83 mile drive between Portland and The Dalles. Photo taken 08/27/06. The eastbound beginning of I-84 from Interstate 5 north runs along side I-5 north and the Willamette River for three quarters of a mile. The roadway passes below flyovers and two viaducts connecting the Morrison Bridge with Oregon 99E (Pacific Highway / Grand Avenue) in this scene. Photo taken 08/27/06. Located in the shadow of the Burnside Bridge, which carries Business U.S. 30 over Interstate 5 and the Willamette River, the first confirming marker for I-84 east appears. This is not technically U.S. 30 yet; U.S. 30 will merge onto Interstate 84 at the Grand Avenue overpass. Photo taken 08/27/06. Interstate 84 and U.S. 30 finally turn away from Interstate 5 and move east toward suburban Portland. U.S. 30 joins the Banfield Expressway from I-5 southbound. Flyovers from both directions of I-5 combine at the Grand Avenue (Oregon 99E north) overpass. Photo taken 08/27/06. “Interstate 80 will keep being Interstate 80.” Eugene Register-Guard, May 18, 1977. “Interstate 80 to become 84.” The Deseret News, August 13, 1977. “Road numbers to change.” The Spokesman-Review, November 3, 1977. “Caldwell’s ‘claim to fame’ light is gone.” The Deseret News, August 21, 1983. “Officials dedicate the final stretch of I-84.” The Deseret News, September 26, 1986.